Better Than Gravy Gravy Mix For Turkey is a powdered and granular seasoning mix that produces a savory Turkey flavor for turkey gravy and other delicious sauces. Blend gravy mix with 1 1/4 cups cold or lukewarm water. Bring to a boil, stirring occasionally. Reduce heat and simmer uncovered for 2 minutes. Turkey with turkey stock, cornstarch-modified, wheat starch-modified, potato starch-modified, autolyzed yeast extract, wheat flour (bleached wheat flour, malted barley flour, niacin, reduced iron, thiamine mononitrate, riboflavin, folic acid), salt, whey, sugar, soybean oil, maltodextrin, turkey fat, onion and garlic, silicon dioxide, poultry flavor (chicken fat, natural flavor), nonfat milk, caramel color, spices, spice extractives. 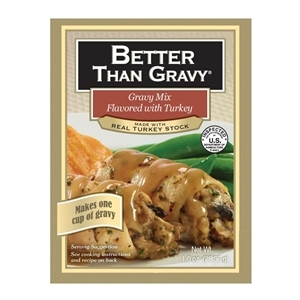 This is the best gravy mix I have ever used. It's the one turkey gravy mix I'm not ashamed to serve. This is THE absolute best turkey gravy mix you will ever taste. People cannot tell it is not made from scratch! Careful, the 'organic' version is NOT the same; Turkey, pretty far down the list of ingredients.